After eliminating the garrison at Ciudad Rodrigo, Marshal André Masséna ordered Marshal Ney’s 6th Corps to advance on the fortress of Almeida. Rather than retreat and cross the river as ordered by Wellington, Crauford courted disaster and chose to hold his bridgehead. Crauford and the French both wanted to control the narrow stone bridge which was the only way to cross the Côa for several miles. In the early hours of July 24th, Ney pushed forward his entire force against Crauford’s outnumbered Anglo-Portuguese Light Division. The first French attacks by Loison’s Division were checked by intense musket and rifle fire. 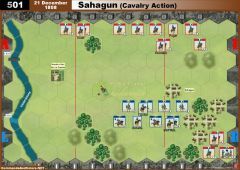 As the fight in the center raged, French light cavalry braved the fire of the guns of Almeida and charged forward, routing the left flank of Crauford’s line. With his line in danger of being rolled up, Crauford ordered an immediate retreat to the bridge. The Portuguese Cacadores and guns were first to cross the bridge while several British battalions held the French at bay. Soon these British units also fell back in good order across the river. 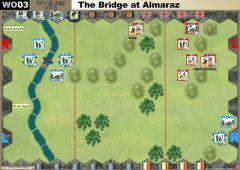 Desiring a complete victory, Ney launched three disastrous assaults across the stone bridge, but all attempts failed to dislodge the British. That night Crauford withdrew toward Pinhel, leaving Masséna to lay siege to Almeida. 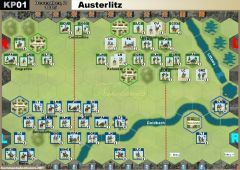 Any ordered Anglo-Portuguese unit (regardless of strength) that exits the battlefield from the bridge hex will count as a Victory Banner for the British army. Exited leaders do not count for British Victory Banners. 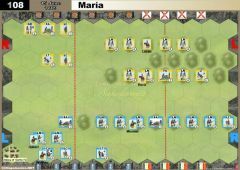 Anglo-Portuguese units cannot exit off the bridge hex when forced to retreat due to ranged or melee combat. 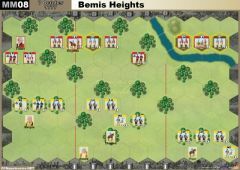 Units must halt or remain on the bridge hex and lose one block for each retreat hex that cannot be taken. If the unit is eliminated, the French player receives one Victory Banner. The River Coa is impassable except at the bridge. The Fortress of Almeida is treated as a town. In addition, Anglo-Portuguese units on a Fortress of Almeida hex may ignore one flag. Used this scenario to teach oldest daughter how to play the game. 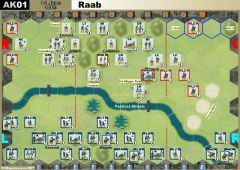 I was the British and my first card I fired the Rifles in the center at her light infantry, taking one down and forcing them to retreat. Her next move she moved a line inf over and fired at the RL, rolling 4 inf hits on the dice. Needless to say, I lost 6-2 but she liked the game. Lost the battle but won the war! 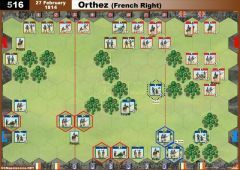 The French got a fantastic hand and rolled over the British lines without losing a unit. The British got one unit off the board whilst the rest just stood around or got beaten up. A terrible run of cards for the British whilst the French had a card to counter everything they played. Played solo today. British victory 6:2. Brits drew bayonet charge and forced march which allowed them to exit three units in two turns. I think I was surprised to hear the number of French victories reported as I felt it was unbalanced in favour of the Brits. I think I'm still not very good at attacking so this is probably why I felt it was a tough slog for the French. played this on line last night on Vassal. along with a final British Cavalry charge - off the map to exit 2 units for the win! Played it twice tonight, once as each side against the same opponent. 2 French victories, first won 6:3 the second 6:4. 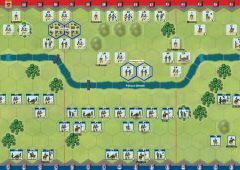 The second game was much closer with the British ready to exit 2 units for victory when a French cavalry charge against one of the ready to exit units forced it into square and stopped it. 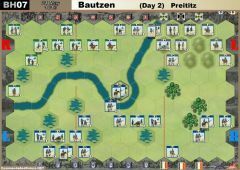 Brits could have exited the other unit to make the count 5:5 but used the move to try and force the cavalry off from the square. 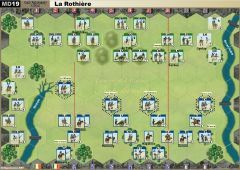 The plan worked but then the French had a card that kept the attack in the centre going and they took the last banner to win. Seems pro French to me. In the 2 games LGM only came up once and that was for the French. They used it to surround the Rifles near the windmill and threaten Almeida. An LGM for the British in the middle of the second game would certainly have given them victory early! Played this last night, as the British, and was intrigued by scenario - unfortunately Le Grand Maneouvre Card spoiled what was looking like an interesting challenge - Brits won at a canter. My advice - remove LGM, or make the Brits use the alternative use if they draw it. Played this one this evening. British drew LGM is opening hand and had 3 units off map (i.e. 3 banners) before the French even played a card. LGM wins this scenario for the British, and enhances my view that withdrawing Exit VP don't work well in C&C. I played this scenario solo twice today. 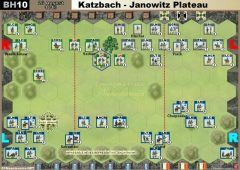 The first was a French victory (6:4) thanks to an attack on their left and then centre whcich forced 2 British generals to escape the battlefield! 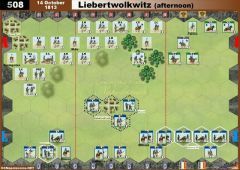 The second was a British victory (6:3) where the centre HA units destroyed the advanced French infantry and two Cavalry Charge cards swept the French LC from the field. Both games were great fun and I really like this scenario where the small hand of cards make squares very important.